What Does the New Elantra Offer? All-new GT and GT Sport hatchbacks join the Elantra lineup for the current model year. Offering spacious cargo capacity and a new turbocharger, the models are favorites amongst 2018 Hyundai Elantra reviews. The sedan version carries over the same specs, following its complete redesign in 2017. The 2018 Hyundai Elantra in Carrollton is also offered in SE, Eco, Limited and Sport trims. 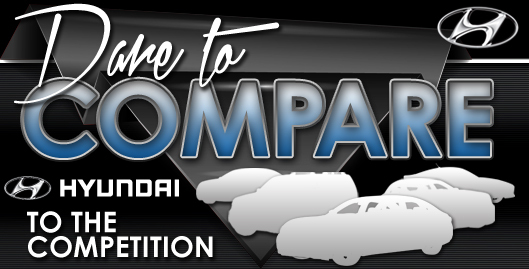 Standards on both the sedan and hatchback models include an easy-to-use touchscreen display, height adjustable front seats and a six-speaker sound system with a CD player and satellite radio. 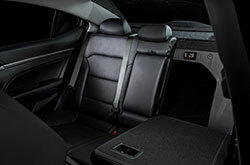 Upper trims get heated rear seats, driver-seat memory settings, leather upholstery and a sunroof that is perfect for stargazing. 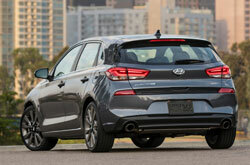 Outside, the top-ranging Limited gets fitted with adaptive xenon headlights, LED taillights and chrome accents, as noted by 2018 Hyundai Elantra reviews. The newly added GT hatchback, it employs a peppy 162-horsepower 2.0-liter inline four-cylinder engine that makes 150 pound-feet of torque. More power can be had with the GT Sport hatchback and sedan models, which utilize a 201-horsepower 1.6-liter turbo that puts out up to 195 pound-feet of torque. This athletic powerplant can be matched to either a six-speed manual or seven-speed dual-clutch transmission. The SE is motivated by a 2.0-liter four-cylinder, delivering 147 horsepower and 132 pound-feet of torque. 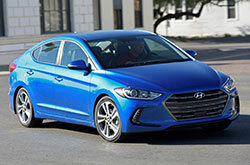 The Elantra Eco uses a 1.4-liter turbo that is good for 128 horsepower and 156 pound-feet of torque - it is the most fuel efficient of the bunch. Every 2018 Hyundai Elantra in Carrollton comes with a suite of standard safety systems that will help keep you and your family safe. 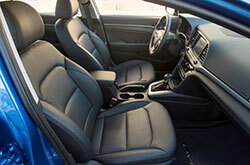 They include front seat side airbags, side curtain airbags, a driver knee airbag, and stability and traction control. The Elantra can also be fitted with emergency telematics, including automatic crash notification and stolen vehicle recovery, to name just a couple. The Hyundai Elantra Is Finally Here! 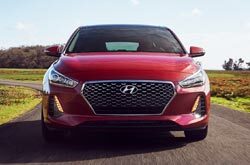 Find out why people looking for new vehicles near Dallas consider the well-liked 2018 Hyundai Elantra instead of the 2018 Nissan Sentra, Ford Focus, Toyota Corolla, Honda Civic and the Chevrolet Cruze. Its onboard technologies and sleek styling might just seal the deal if you're looking at a number of cars. See if the 2018 Hyundai Elantra is a best bet for your particular needs, then browse our site to find hot-off-the-press information on great short-term lease offers. As your neighborhood car dealer, we're the place to go if you want to find the sought-after Hyundai Elantra. When deciding on a car, it's essential to make a responsible choice; that's why we've included this 2018 Hyundai Elantra review the perfect fit on our site. Get primed to be impressed with the stately Hyundai Elantra for sale in Carrollton, TX. Fill out our contact form to schedule an appointment for a showing. Also, before your visit, you can see its classy cabin from all sides by viewing our video.